This research seeks to examine child trafficking in Ghana: cultural perception, various forms, and why it occurs so frequently. Furthermore, it seeks to understand and differentiate child trafficking from child labor, and child labor from commonly perceived responsibilities that children have. Understanding the cultural perceptions of such terms will provide insight into the Ghanaian perception of exploitation and what is, and what is not, determined acceptable. Perhaps further education on such topics will convince parents not to sell or give their children to other individuals. Research was conducted through a series of interviews with elected officials of trafficking communities, non-governmental organization administrative office holders, traffickers, and children. Former scholarly data was reviewed to supplement observational research, which was conducted to garner a better understanding of all parties interviewed. In order to understand the reasons why child labor was deemed necessary in these households, this research observed the cultural, academic, and economic patterns of each household. In addition, this research also informed how the child and/or the family’s life improved or worsened as a result of the child working. The data reflects the experiences of the child, specifically the child’s exposure to abuse, hindrances to the child’s education, living conditions, and health issues. Often the community and parents of the child are ignorant to the conditions their children are subjected to during child labor. Research was conducted in the fisheries of Ghana, which are located in the Lower and Upper Volta Regions, more specifically the Adidome and Kete-Krachi areas. These locations were chosen due to the prevalence of child trafficking in these locations. Additionally, urban cities are more likely to attract children that participate in such industries. According to the Ghanaian Children’s Act of 1998, a child is a person below the age of eighteen years. Furthermore, a child’s welfare is to remain priority to any court, person or institution (Acts 560, 1st clause, p.6). However, Ghanaian society does not identify a child by this definition. Rather, Ghanaian culture identifies a child to be an individual with no great responsibility, such as a person that does not have children of his/her own (Formal Meeting, Akumatey). A child has the right to live with parents and family and shall not be denied growing up in a caring and peaceful environment (Act, 560, 5th clause, p.7). Although the law is clear, the notion of “rights” may become less important and even nonexistent when people live in challenging circumstances. Thus, when discussing “exploitation”, it is important to acknowledge that under harsh financial constraints, this term is non-existent, and is rather interpreted as an accepted way to make a living. It is common for Ghanaian children to actively engage in the work force. Due to the long history, strong presence and economic necessity of children working in communities, this work may not be perceived as ‘labor’. Therefore, it is necessary to clearly define the appropriate scope of work for a child. This definition will subsequently create a clear definition for child work, and all other forms of work not appropriate for a child will be strictly defined as child labor. This distinction is important for understanding what a child’s rights should be and protecting these rights. In addition, this clear separation between child work and child labor is important when informing and educating the community for intervention and prevention purposes. Child work is work not perceived as harmful because it does not endanger a child’s mental, physical or moral health and development. Child work is perceived as pertinent for the child to acquire basic knowledge, skills and responsibility (IN-Network Baseline Study, 1). Child labor is work that interferes, or is likely to interfere, with the child’s education, health, physical, mental, spiritual, moral, or social development. This includes work that exposes a child to an environment that can hinder development and subjects a child to different forms of dangers including, but not limited to, excessive hazards to injuries, toxic substances, sexual abuse, violence and death (IN-Network Baseline Study, 2). These situations are all classified as the “Worst Forms of Child Labor” because each case is contingent upon child exploitation. Labor is exploitative when it deprives a child of health, education or development (Fishing, 3 and Act 560, 87th clause, p.27). Child Trafficking is the process of receiving and transporting a child from one place (usually origin community) to a different location (usually destination community) for the purposes of engaging the child in exploitive labor that is likely to interfere with the child’s mental, physical, spiritual and moral welfare, and exposes the child to abuse, hazard or danger (IN-Network Baseline Study, pgs. 2 and 6). The child is usually taken by an intermediary, or sometimes independently decides to leave, and is subjected to exploitative labor for the purposes of economic gain (Rescue Foundation Ghana, 37). It is important to note that the phrase “child trafficking” does not virtually exist in the Ghanaian vocabulary and is absent in Ghanaian cultural conceptualization. This is due to the culture of poverty and the socialization of how a child is perceived and their responsibility to the family (Personal Interview, Asiam.) The act of consenting for children to be involved in the fisheries is understood as acceptable work. This insight is significant to understand why this transaction is not perceived as dangerous to the child and is so widely practiced in Ghana to manage the poverty many households face. Child Trafficking can be either internal or external transactions. However, this research explores one form of child trafficking: internal child trafficking in Ghanaian fisheries. Fishing is a popular job in Ghana since it provides autonomous employment opportunities. In times of scarce resources it becomes competitive since it is an attractive form of employment when formal employment is unavailable and demands for survival are high (Personal Interview, Asiam.) Community members commonly view the fishing industry as a way to quickly generate funds. Thus, child trafficking in the fisheries is popular in Ghana because poverty drives households to send their children to work for supplementary funds. Child trafficking in the fisheries results from poverty. Households often lack sufficient monetary resources to adequately live and send their children to school (Personal Interview, Awadey.) Thus, children have to assume greater responsibility and contribute to the household’s survival (Formal Meeting, Akumatey.) This contribution can take form in many ways, such as being sold out for labor, voluntarily relieving the household by moving out, or selling goods while still living within the household. In addition, because most households lack the means to send their children to school, parents are more readily amenable to allowing their children to stay with other people, sometimes strangers, under the false premise that their children will be sent to school or taught a trade. When examining this form of child trafficking, one observes the direct correlation between economic status and educational achievement. Usually, the heads of these poor households did not receive an education because they too were forced to work at young ages and/or were unable to receive an education because of poverty (Personal Interview, Awadey.) Thus, poverty becomes generational when their children follow the same path. Child work is the direct result of a cycle of poverty, made manifest by the struggles people face, and the ways in which people live in this environment. Child Trafficking often negatively affects formal education. Being withdrawn from school can negatively affect a child’s ability to attend school in the future, which often results in apprentice work if the child is rescued (Personal Interview, Achibra Jr.) The child’s age at the time of rescue usually determines their decision to attend trade school; they may feel insecure about enrolling in a lower level at an older age (Personal Interview, Asiam.) Also, the child may not have the option to attend school, and therefore, must learn a trade to eventually build an independent economical foundation. Trafficked children simultaneously enrolled in school often suffer from tiredness and may not be as motivated or focused in the classroom (Fishing, 8.) This, therefore, has a negative effect on their academic performance. In the Ghanaian culture, it is common for parents to send their children to work, either within the household or through sold labor, for a period of time to accumulate the funds to continue future education (Personal Interview, Awadey.) Oftentimes, the initial plan is that the child will start school, withdraw to work, and then continue school later. However, this plan may change due to internal or external factors, such as the trafficker violating the verbal contract and keeping the child beyond the agreed amount of time, the money being spent by the parents for other necessities, or the child choosing not to attend formal school after being returned home or rescued. Once again, it is important to note that the lack of formal education often results in poverty, which is perpetuated in subsequent generations. Consequently, this institutionalized poverty is a primary reason that society resorts to child trafficking as a means for survival. Children trafficked into fishing in Ghana by fishermen are subjected to hazardous conditions, denied access to education and healthcare, and are exposed to various forms of abuse (Fishing, 1). This form of child trafficking is heavily concentrated in the Volta Region of Ghana. According to the Center for Human Rights Development (ACHD), children engaged in this industry are often trafficked from other communities. These communities include villages of the Lower Volta Region, whose children are transported to the Upper Volta Region, and coastal towns neighboring the multiple fishing communities in Lake Volta (Tengey and Oguaah, 2002/Fishing, 1.) Due to the close proximity of these children to the fisheries, they are generally familiar with the duties and lifestyle of fishing. This close proximity to fishing communities may also explain why a large parent population is more willing to allow their children to engage in fishing work. Furthermore, fishing may be regarded as acceptable due to high communal participation in the trade and familial affiliation. boy is returning from a nightlong fishing excursion with no shirt or shoes. Poverty is the main factor that influences child involvement in the fisheries. The economic structure of Ghana is one that does not generate large revenues (Personal Interview, Adevu and Meeting, Odotei.) Thus, it lacks the means to invest significant expenditures toward education, as evidenced by a low national rate of senior high graduates (Lecture, Odotei). Just recently, the Ghanaian government implemented a policy that provides uniforms and school lunches to children from extremely destitute households (Lecture, Odotei.) Unfortunately, this measure is not widely accessible to all schools in Ghana, especially in rural areas where the need is highest. Limited or no education generally means a person can only work in physically strenuous jobs that can only provide the bare necessities for a household. This makes it more probable for one or more children to enter the fishing workforce. The fisherman is commonly uneducated and was usually raised on, or near, the lake (Personal Interview, Asiam.) He may or may not have a family and usually finds himself desperate for additional help to avoid self-exhaustion and poverty (Personal Interview, Hlorka.) Hiring adults would be too expensive. However, hiring children makes exploitation more probable. Hiring child workers allows the fisherman to create a larger workforce without spending a significant amount on wages. This larger workforce will generate a larger catch, which will result in an increased income for the fisherman (Personal Interview, Solomon.) Some fishermen justify the high participation of children in the fisheries by claiming that children’s fingers are smaller, and therefore, can take the fish out more easily and untangle the net quickly. Other fishermen support this argument and assert that the decreased weight of children allow for an easier and faster dive into the lake to unfasten the net. 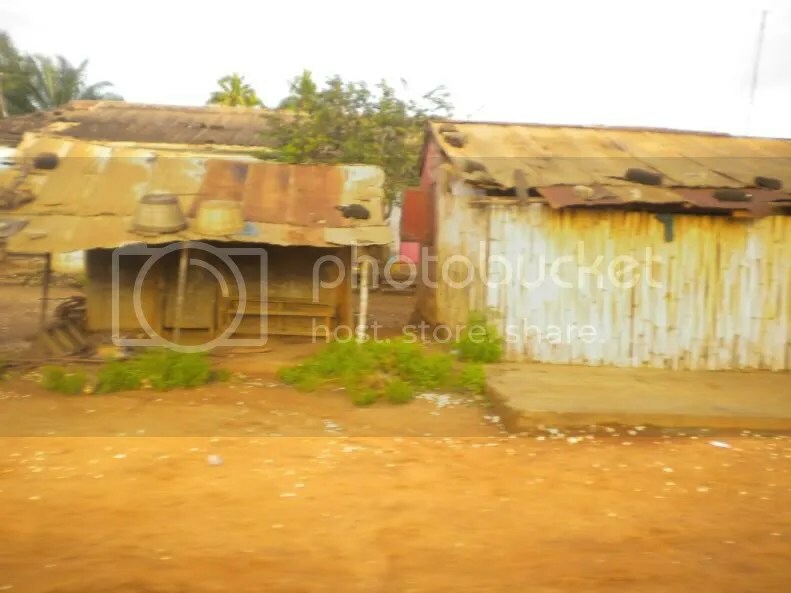 homes in this poverty-stricken area. Institutionalized poverty perpetuated by the Ghanaian economic structure does not particularly encourage formal education as realistic or relevant (Personal Interview, Asiam.) Thus, a high percentage of Ghanaian households are uneducated and living in poverty. Most poor households have more children and are unable to adequately provide for every family member (Persoanl Interview, Yartey.) Children are often relied upon for monetary assistance and sent to the fisheries. This is socially acceptable because fishing is often common in the communities in which trafficked children live (Personal Interview, Asiam.) It is also important to note that all of these exchanges are purely economic and the family, as well as the fisherman, is driven to such measures to avoid the harsh reality of poverty. Often trafficking can occur when households are financially challenged and give children to intermediaries or fishermen to work for monetary exchange (Rescue Foundation Ghana, 37.) These intermediaries are often people of familiarity. Fishermen, on the other hand, may or may not be known to the family. Although less common, the child can also independently decide to work for the fisherman to receive economic gain (Personal Interview, Aguada.) In these cases, the children do not perceive the conditions as exceptionally harsh and understand the situation to reflect them earning a living for themselves. Thus, they do not see this work as exploitative. a verbal agreement is often consolidated between the parent or guardian and the fisherman or intermediary. This agreement usually entails a guaranteed payment for the work of the child, demands the child to work an average of one to five years, and restricts, or highly limits, any parental contact with the child until the term is complete (Personal Interview, Hlorka.) Depending on the particular fisherman, the payment may be partially given in the beginning of the transaction with the rest disbursed at the end, or it may be paid as an annual amount, or the total is disbursed at the end. Payments in the form of kind are not currently as popular, but usually include cattle, goats or other farm animals. 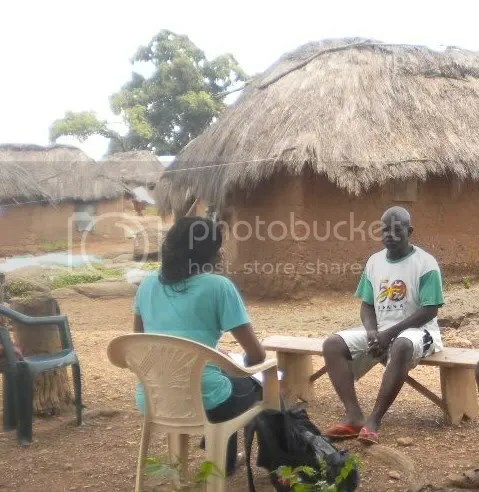 Photograph taken November 23, 2010 at Island Lala of the Upper Volta River during an interview with Fisherman who formerly trafficked children, Francis Hlorka. Other children that work in the fisheries are the children of the fishermen. It is important to note that by definition, these children are not trafficked because this term would imply that these children were moved from one place to another location for working purposes. Rather, children of fishermen engaging in fishing that interferes with their physical, mental, or educational development are subjects of child labor. It is important to note that the daily labor demands of a fishing child are contingent upon gender. Young boys are more targeted in this industry because boys actively participate in the fishing aspect of work involved (Personal Interview, Awadey.) Conversely, girls retrieve the fish from the boys, smoke the fish, sell the fish, and are confined to domestic work. Children working the fisheries are usually forced to wake extremely early, usually between 4am to 6am (Personal Interview Hlorka and Solomon, Fishing 8.) Boys are instructed to pull the net out of the lake which can take one to five hours on the lake, depending on where the net was cast, how large the catch is, and the width of the net. This act requires the boys to canoe to the site, sometimes deep in the lake (Personal Interview, Hlorka and Solomon.) Upon arrival to the site, some boys are made to dive into the lake to release the net from the bottom of the lake. Meanwhile, other boys on the canoe are pulling the net, while others are paddling away from the site to facilitate this process. The boys that dove into the water get back into the boat and then help paddle back to shore. After, the boys are generally made to pick the fish from the net. While doing this, they may cut themselves with the fish scales. Depending on the fisherman, who is referred to as “Master,” the children may or may not be granted the privilege to eat breakfast (Personal Interview Hlorka and Solomon, Fishing, 10.) The boys may or may not have time to rest, or may sometimes be forced to do other fishing related projects for the fisherman. Times ranging from about 3pm to 9pm is the time allotted for the boys to return to the lake to cast down the net. This task also requires the boys to dive and properly attach the net to a stationary object in the lower lakes. It also requires precision to measure the potential catch at the site. After, the boys return from the lake and may or may not be given dinner depending on the fisherman. 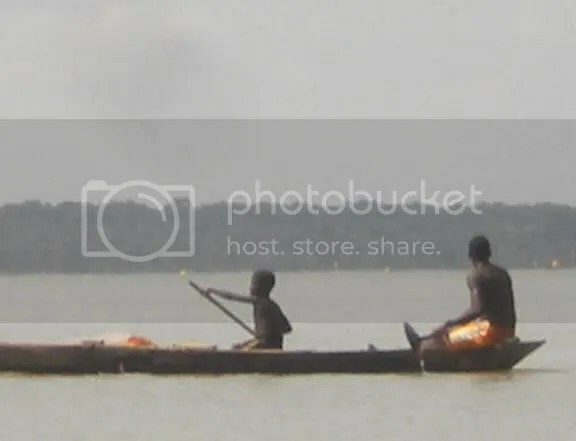 Photograph taken October 23, 2010 on Upper White Volta River: Young boys and men returning from a night of fishing. The likelihood of these boys being trafficked is great considering the region in which this photograph was taken. Girls are instructed to claim all domestic responsibility. Before the boys arrive with a new catch of fish, the girls are generally occupied cleaning. After, they help retrieve the fish from the net and hawk it a far ways to clean. Then, they lay the fish out to dry, smoke the fish, and begin to sell it for the fisherman. This statement is significant for understanding the dynamics of trafficking. Fishermen are primarily interested in young children and not adults, for the sole reason of exploitation. Since the fisherman can easily control the children and their actions, the fisherman can also reap the benefits of child labor. As a result of this being an economic transaction, the fisherman is not inclined to consider the safety of the child, but rather, personal monetary gain. It is apparent then, that the concept of safety, under the circumstances of children participating in the fisheries, is a secondary concern to economic gain for the fishermen. Purchasing lifejackets is not only a cultural restriction, but an additional expense. 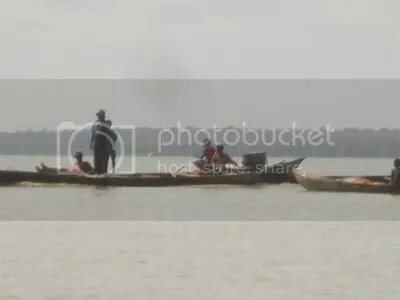 According to Fisherman Francis Hlorka, when referring to the use of lifejackets, he said, “those things are costly and we cannot buy them.” Likewise, it is vital for the fisherman to make every boy dive to garner more fish and increase income. In addition to not wearing lifejackets and not knowing how to swim, the boys participating in diving are also not connected to the boat, thereby increasing the child’s chances of drowning. Often the children must wake up early or travel during the middle of the night. This exposes them to extremely cold weather, while wearing only underwear and being forced to dive into the water. Also, often the children continue to fish during stormy weather. 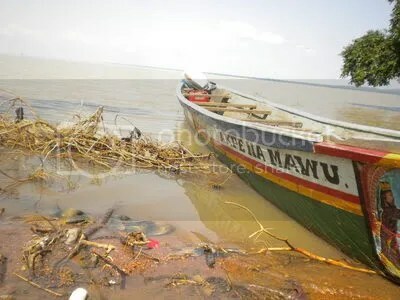 Recently rescued 19 year old, Tetteh Djimeh, said that storms on the lake are common and do not stop the fishermen from sending the boys or keeping the boys on the lake. This photograph was taken October 23, 2010 in front of Lala, a trafficking island in the Upper Volta Region. Near the shore, you see the children preparing for a fishing excursion. Most do not have shoes and all have tattered clothing. In some cases, the fishing expeditions are very deep into the lake, causing the fisherman and the children to return late at night. Sometimes, when these long journeys take place, the fisherman may not have permanent or temporary accommodation near the site. Therefore, the fishing children are forced to sleep in bushes, on the ground, or in the canoe for nights at a time. In addition to being vulnerable to sickness, the boys are exposed to worms. According to 16 year old, Joshua Tsatsu, worms can enter underneath the skin. This causes extreme pain and leaves scars. Out of ten boys interviewed in Kete-Kratchi, over half experienced this. Photograph taken October 23, 2010 at Lala Island, along the Upper Volta River. Lala is an island with a significant amount of trafficking incidents. 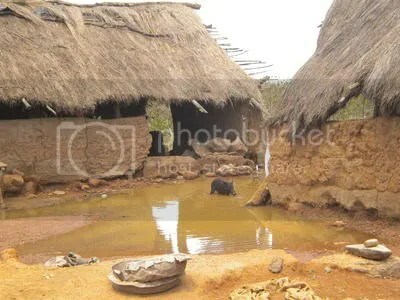 These are the poor living conditions children usually endure: swampy waters and insufficient mud homes. Children participating in fishing are often denied the access to education and healthcare because they are too expensive (Personal Interview, Hlorka.) These additional payments would decrease the fisherman’s profit. NOTE: Data below was extracted from the graph above. This graph separates the children working under parents and/or family members who are fishermen to compare the differences between children working or not working with a family member and the direct correlation with education. 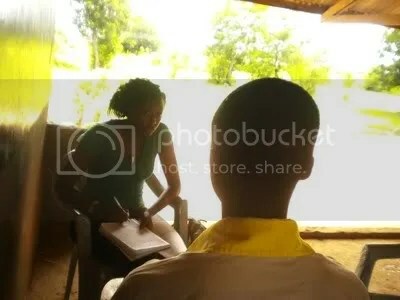 Photograph taken October 18, 2010 at the Catholic Primary School in Adidome, Lower Volta Region during an interview with a recently rescued boy, now enrolled in school. Another reason explaining why children of fishermen are more likely to attend school while fishing pertains to the education of the fishermen himself. Usually, fishermen lack robust educations, and therefore, find themselves in this field of work. This shortcoming can allow fishermen to understand that higher education facilitates upward mobility with the absence of physical labor. However, it is important to examine the affects of fishing on the education of participating children. This can dramatically weaken the child’s immune system leading to chronic sickness, a permanent disease, or death. Verbal assaults are usually coupled with the mandatory parental absence from the child. Fishermen are apprehensive of allowing familial reunifications because some believe children may stay home and fail to return to work. This extended absence may make children yearn more for their parents and ensure the child work to the highest expectations. NOTE: The graph below extracts data from the graph above to provide insight as to how many deaths the interviewed boys witnessed. Other trafficked children in extreme conditions had similar stories. According to 16 year old Joshua Tsatsu, Fishermen forbade their child workers to ask, or beg, for food from outside sources. Fishing children are exposed to sexual abuse as well. Although boys are not fully protected from this, girls are more likely to be subjected to sexual abuse. Girls can be attacked by Fishermen, the children of fishermen, neighboring males, and trafficked boys occupying the same household. Fourteen year old Gifty Agbanyo, originally from Battor and sent to Aboatese, admitted that there were many times men and boys tried to sexually abuse her, but each time, she was fortunate enough to escape. This research was determined to examine child trafficking in Ghana. Cultural influences differentiate what society perceives as appropriate and inappropriate roles for a child. Considering Ghana’s culture of poverty, child work is necessary. The concept of child labor, however, becomes controversial, as it is contingent upon exploitive labor. However, it is important to note that the concept of exploitation in times of hardship is often non-existent and child work is viewed as a child’s responsibility to his/her family. It is also important to address the issue of education. Although some parents do not know the importance of educating their child, many that do understand its importance lack the financial means to educate their children. If children were permitted to attend school because funding allowed it, then the probability of most children being trafficked for labor would decrease. Moreover, a change within the Ghanaian economic structure is necessary to enhance access to education for the child and employment opportunities for the parents. Additionally, it is important to address the issue of general community ignorance towards child trafficking. Educating the society through means of awareness will promote intolerance to the selling of children for temporary economic gain. Poverty is the main factor influencing child labor in Ghana. Parents, or guardians, of such households commonly have a limited educational background. It is more difficult to provide for a family without an education due to the extremely narrow, formal workforce in Ghana. Therefore, many uneducated Ghanaians resort to micro-entrepreneurship in the informal economy. Usually, however, this form of employment proves insufficient to properly provide for households, which are commonly large in number. Thus, the child assumes greater economic responsibility by working in the family trade, being sold out for labor by the guardian or independently selling own labor. Although the Ghanaian government has recently implemented educational reforms, these programs are not reaching an overwhelming majority of the nation. Photos provided by Marlysa Thomas.